Leaders and prominent figures from around the world all expressed thier deepest condolences and renewed their solidarity wishes with Turkey as they condemned the 'heinous' terror bombing that rocked Ankara late Wednesday, killing 28 and injuring 61. German Chancellor Angela Merkel sharply condemned the attack in capital Ankara. The chancellor said in a statement Wednesday that she was horrified by the attack and that her thoughts were with the families of the victims and the injured. She said: "I'm telling the Turkish people: we as Germans are sharing your pain." She added: "In the battle against those responsible for these inhuman acts we are on the side of Turkey." EU High Representative and Vice President Federica Mogherini and Commissioner Johannes Hahn issued a joint statement in which they offered their "fullest sympathy" to the Turkish people and authorities while expressing their support to and solidarity with Turkey. The statement said: "We are with Turkey and its people in these difficult times and stand by all those who suffer from the consequences of such violence, and of terrorism." Azerbaijani President Ilham Aliyev also extended his deepest sympathies for the deceased and wished a quick recovery for the wounded in a phone call with President Erdoğan after the attack. Erdoğan made the phone call to cancel his visit to Azerbaijan scheduled for Thursday. The Pakistani Foreign Ministry also issued a statement condemniing the attack in 'strongest terms' while extending "heartfelt condolences to the brotherly people and government of Turkey." "Our thoughts and prayers are with the bereaved families," the statement said, further adding that there was "no doubt that Turkey would eliminate the scourge of terrorism with its strong will and unshakable resolve." "Diplomatic Missions of Israel in Turkey expresses its sorrow and extends its condolences to the Turkish government, the Turkish people, and to the bereaved families for the loss of innocent people in last evening's heinous terror attack." Stating that Israel "strongly condemns such acts of terror," the message wished a quick recovery for the wounded victims. The Spanish government issued a press statement condemning the attacks. Spain offered condolences in the statement and stated the support of the Spanish government, saying they stand by people of Turkey in the fight against terror. NATO's secretary general Jens Stoltenberg also strongly condemned the "terrorist attack" in Ankara in a statement Wednesday and offered his "deepest condolences to the families of those killed and to the Turkish people." He said there can be no justification "for such horrific acts" and that "NATO Allies stand shoulder to shoulder in the fight against terrorism." 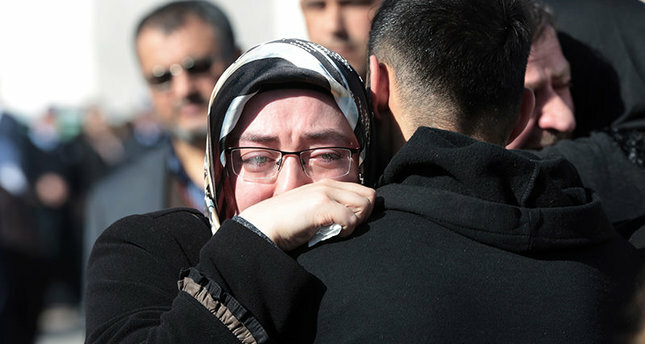 "Deeply saddened, shocked by terror attack in Ankara. Our hearts and prayers go out to those affected," U.S. Ambassador to Turkey John Bass said in a tweet after the bombing, condeming the terror attack. Richard Moore, the British Ambassador to Turkey, also offered his condolences to Ankara on the attack with a tweet saying: "U.K. stands shoulder to shoulder with Turkey at this difficult time. Utterly condemn terrorism." Foreign Minister Mevlüt Çavuşoğlu spoke with his U.S. counterpart John Kerry on the phone on Thursday in which Kerry offered his condolences to Turkey over the Ankara attack. The two top-level politicians also discussed the latest developments in Syria, according to media agencies. The messsages of solidarity continued on Twitter with a tweet from UK foreign secretary Philip Hammond. He said: "My thoughts are with the victims of #Ankara terror attack. The UK utterly condemns this senseless act of violence."